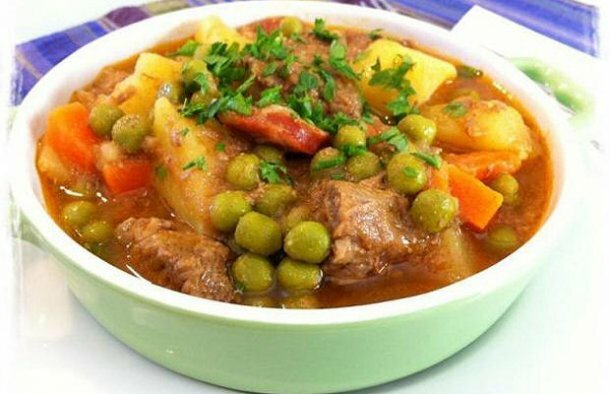 Serve this tasty Portuguese beef and vegetable stew with chouriço (guisado de carne e legumes com chouriço) with parsley and a few slices of homemade bread. Chop the onion and the garlic, cut the carrot into slices put all three in the pressure cooker along with the meat, the crushed tomatoes, the wine and a little salt and pepper (to taste). Add enough water to cover the meat and cook for about 30 minutes after boiling. Let the pan lose the pressure before you open it, then add the sliced ? ?chouriço and the potatoes cut into cubes (about the same size to cook equally), check for salt and pepper and let it cook without the lid on the pan. When the potatoes are almost cooked, add the peas, if necessary add a little more water. Let it simmer until the peas are cooked. Serve with chopped parsley and a few slices of homemade bread. 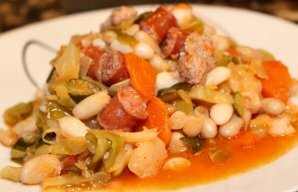 This Portuguese beans and meat stew recipe is one of the most traditional and ancient dishes in Portuguese gastronomy, and is absolutely delicious. 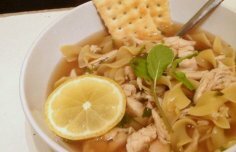 How to make Portuguese chicken soup (canja).